Step this way while I take you back in time just a wee bit to my last birthday. I’m unwrapping a present from Mum and Dad, and I’m stoked to find two new squid jigs. Whilst I haven’t been out squid fishing for quite a while, the jigs are brilliant, and may just be the excuse I’ve needed to get out there to do a bit more squidding. Nice one Mum and Dad. I proceed to unwrap the second present, and I’m a little confused? This present contains a set a pre-rigged longshank hooks? Now don’t get me wrong, it is definitely a great present, however everyone knows, especially my parents, that I make my own custom rigs…. it’s a bit of a hobby. Curious, but thankful, I raise a cold beer and say cheers… thanks for the presents. Bare with me one moment while I pick myself up off of the floor! You have got to be kidding me!! My grin goes from ear to ear and I just have to read it again to make sure I’m not dreaming! Flip it over, yep… Franklin Harbour, Cowell. Flip it over again, yep… To Mark …… yadda yadda yadda yadda yadda. I look up at Mum, and I can’t believe it! This has got to be the one of the best presents anyone has ever been given. Forget your cars with big ribbons on them, and you can have your gold jewellery…. 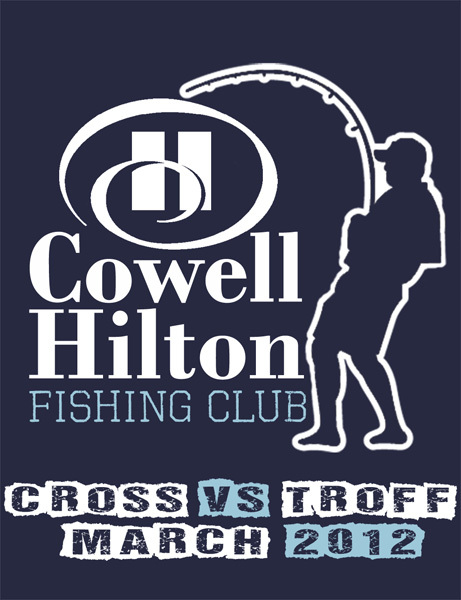 I’m going fishing, and I’m going to Cowell with the lads!!!!! You bloody beauty!!! Bare with me here… I just need to pause for one second before continuing the story…. thanks for the present Mum and Dad, I love you. Let’s progress shall we? I’m gobsmacked and over the moon. I take a look around the room and everyone is smiling and are as blown away as I am. But what’s this? Dad’s smiling and happy, but has that goofy “I have no idea what’s going on” look? Well, it just happens to turn out that Dad had no idea what was going on, and for a very good reason. The birthday present that he was about to receive very early was that Mum was shouting him a trip to Cowell also!!! It would be the four of us! Dad, myself, Uncle Kym, and my cousin Brett. Un-bloody-believable! OK. So the scene is set and we can fast forward a tad and begin the real yarn. Buckle in, it’s going to be epic. 0530 hrs. Dad and I have arrived at the airport and we’re going through the usual check-in procedures. No… we have no aerosols. No… we have no bombs. No… we’re not smuggling the spawling in our cases. No… we have no sharps. Yes… I’m married.. sorry about that. Yes… that’s all the baggage we have to check in. We grab the tickets and start making our way through the terminal. Before heading through the security check point, I quickly grab my book for the flight out of my duffelbag and … oh sh!t!! My leatherman is in the bag!! I quickly scurry over to the service desk to see if Dad’s bag has already moved out the back… damn! Aimlessly I look around to see if maybe there’s a post office so I can mail the leatherman back to myself. Grrrrr!!! Yeh… I’m excited, but seriously, how could I stuff up this badly! Boom.. crash… clunk. That’s the sound a leatherman makes when it’s thrown into the bin… and I’m a dead man when my beautiful bride finds out I’m negative one on the leatherman front. Sulking like a three year old child, I make my way to the security checkpoint, empty my pockets, and put my duffel bag onto the conveyer to be x-rayed. I watch the screen as my bag passes into the black abyss… and stops. The security officer repositions herself on her chair, and starts zooming in on the x-ray of my bag. She scrolls the image to the left, and then slowly to the right. Zooms in a bit more… and pauses. She takes her time having a good look from all angles, and cautiously tries to figure out what the strange tangle of metal, ceramic, and ball bearings is. Three of my reels are all together in a protective cloth, and amusingly it does look like some sort of dodgy electronic contraption. The conveyer belt continues, and either the 60 year old security officer knows what a bunch of reels on an x-ray looks like, or it’s too early in the morning to bother investigating further. A quick inaudible sigh.. and Adelaide… here we come! 0615 hours: A captain’s voice ceases the sound of muttering nervousness prior to take off. “We’re sorry for the delay folks, but we seem to have some sort of trouble with engine two. It shouldn’t take too long and we’ll be on our way…..” WTF!!! I look around and wonder if it’s just me who thinks that what the captain has just said sounds a bit more serious then implied? Who can say “some sort of trouble with engine two” in a strangely calm yet dulcet tone similar to that of describing a wine as shady, but cool on the palate, yet rich with crescendos of lemon, apple, and summer berries! It’s a bloody engine, not a toilet roll dispenser! These things do not ‘appen! Clunk clunk clunk…. bang bang bang… ting ting. “Ah… ladies and gentlemen.. this is your captain speaking. Sorry for the slight delay, but we should be on our way very shortly. Engineering have advised us that the problem is a little bit more difficult to fix than first thought, and we need to move away from the terminal so that they can have a better look. Once again, our apologies for the delay and we should be on our way shortly.” Don’t give me that airy fairy talk mate! In plain English you’ve just told me we need to move the bloody plane away from the terminal as the engine is going to blow up and we wouldn’t want to cause too much collateral damage to the surrounding area! All I want is to go fishing, is that too much to ask for!?!. Manuel scurries away holding his head with one hand and his arse with the other. Basil storms off to close the valve himself muttering “Dragon!” under his breath. Right.. enough of this idle chit chat. In short, the plane finally takes off… flaps it’s wings furiously… and we land in Adelaide without any further drama. Grandad picks us up from arrivals and drives us back to his place so we can catch up, help out around the house with some odd jobs, and wait for the Troffs to finish work for the day. Not long now….. I can feel it…..
It’s finally starting to become a reality. Yes there was a bit of drama at the airport, and yes, there were some issues with a minor part of an aircraft, however the time has come, and right on cue, reversing up the street in all it’s polished splendour is the key to our fishing glory… Uncle Kym’s Haines Hunter 560 Classic. A quick pinch of the arm, and yep, this is really happening…. Cowell, I know it’s been 32 years since I last visited, and I’m extremely sorry about that, but here I come! We mark our territory, get a snap to show off the shirts, and we’re on our way. Cowell.. hold on to your britches… here we come! Now I’m sure your drinks are probably running pretty low by now, if not empty… so I’ll wrap up part one of the story. The rest of the drive up and over to Cowell was a mix of amazing scenery, a handful of fishy tales, and a few good old yarns. A quick dodge of a skippy or two (brilliant driving skill Uncle Kym!) on the highway, and we arrive at the “Cowell Hilton”. Magnificent! Just before I sign off…. 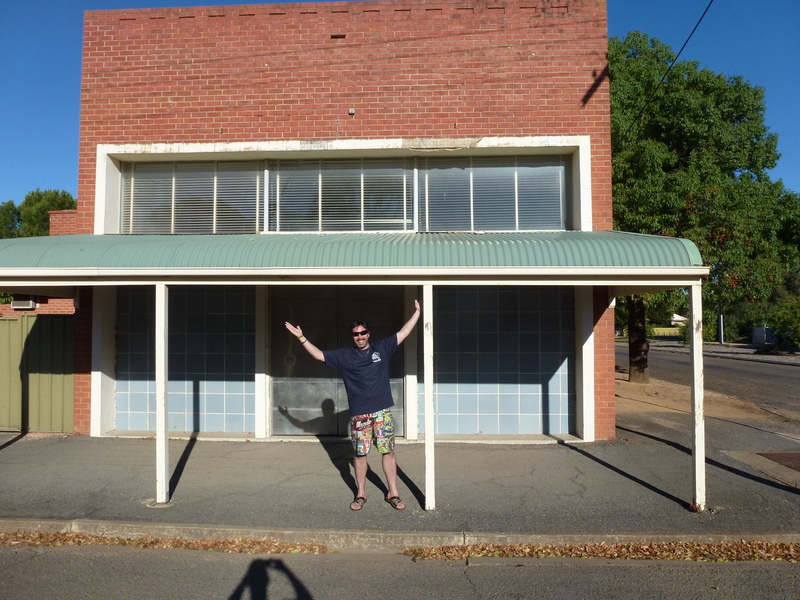 as requested by one of my readers, here’s a quick happy snap from outside the Snowtown Bank which was along the way. If you don’t know what it’s all about, Google “Bodies in Barrels murders” and have a bit of a read a horrible part of South Australia’s history. Hey, nice 1st installment. It’s been ‘verified’ as as factual! Can’t wait for the next series! 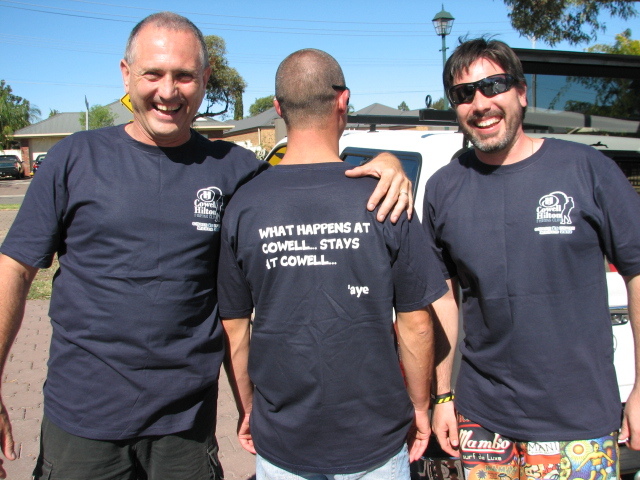 Just remember though; ‘What happens at Cowell… stays at Cowell…, aye’. Not sure about the title, aye? Foot note; We returned for Easter week-end and did it again! Score – Troff Snr & Jnr 4 a piece / Snapper 2 (large ones lost. But put the loss down to experience). Tight lines (and fishnets), Troffs.